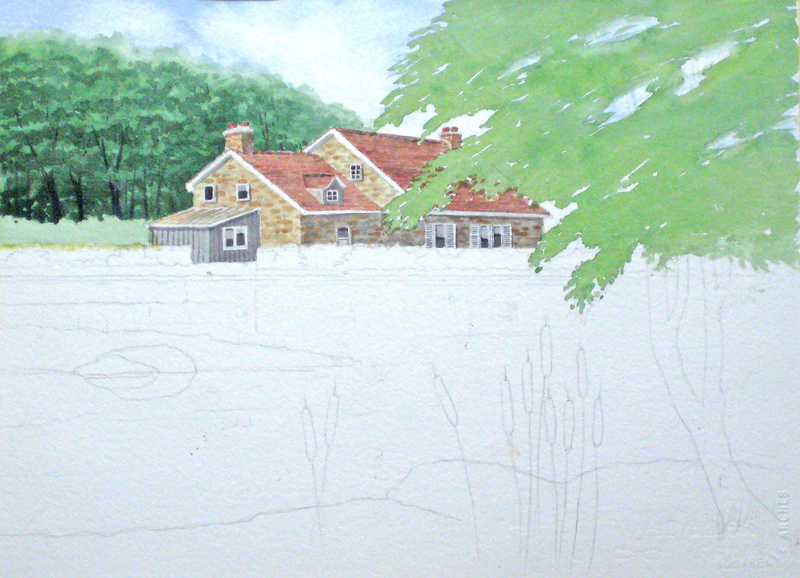 Next we begin blocking in the background trees, using the same technique from our recent tree project. 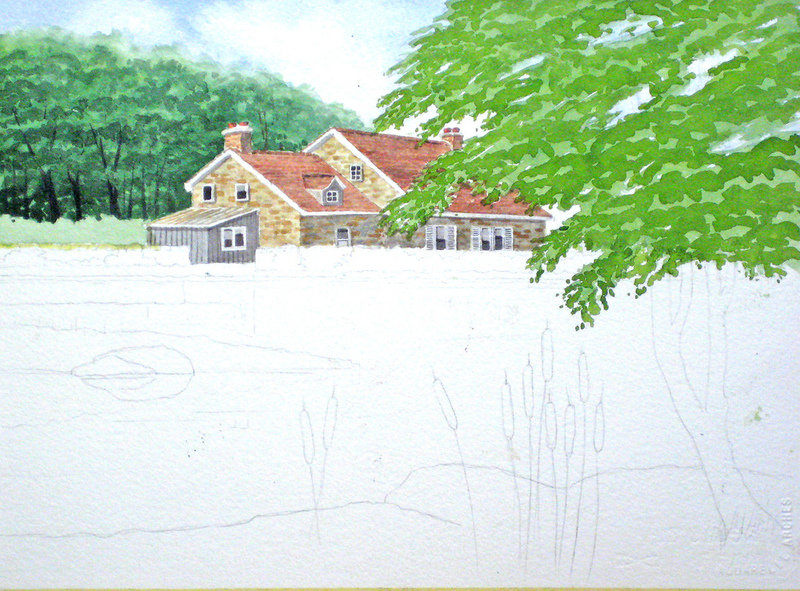 Begin by selecting areas for negative painting. Note we have left out the lower hedge for later work. Use a #4 or 6 round brush loaded with colour. As these trees are in the background they will contain more blue than our foreground mix. 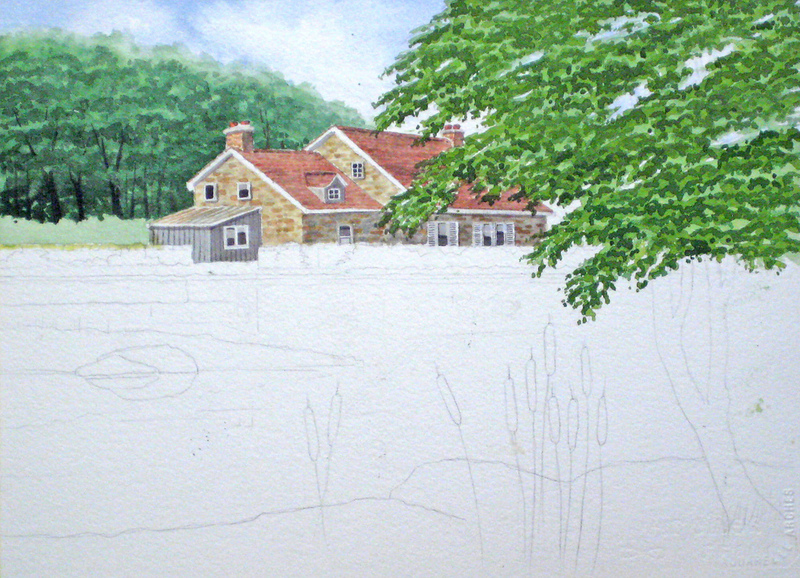 With the cottage protected with liquid masking, you can paint quite freely up to the edge.Next we begin blocking in the background trees, using the same technique from our recent tree project. 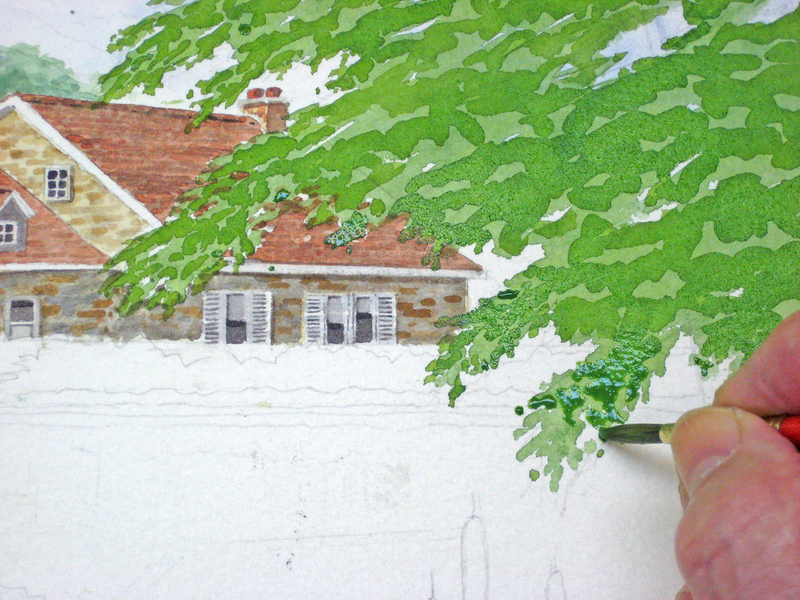 Begin by selecting areas for negative painting. Note we have left out the lower hedge for later work. Use a #4 or 6 round brush loaded with colour. As these trees are in the background they will contain more blue than our foreground mix. 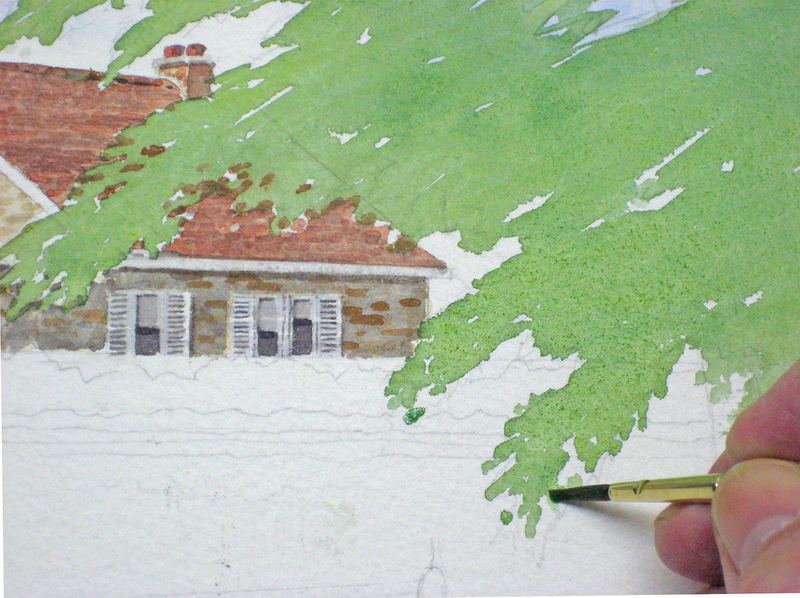 With the cottage protected with liquid masking, you can paint quite freely up to the edge. 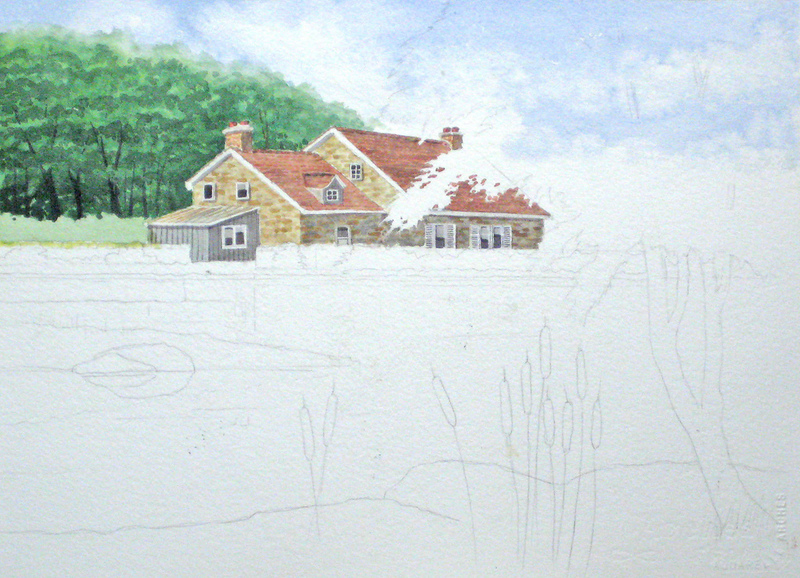 After the second layer blend all this with a wash of clean water using a 1/2″ square brush. With some emphasis on the lower trees were it gets darker, step back and view the results. 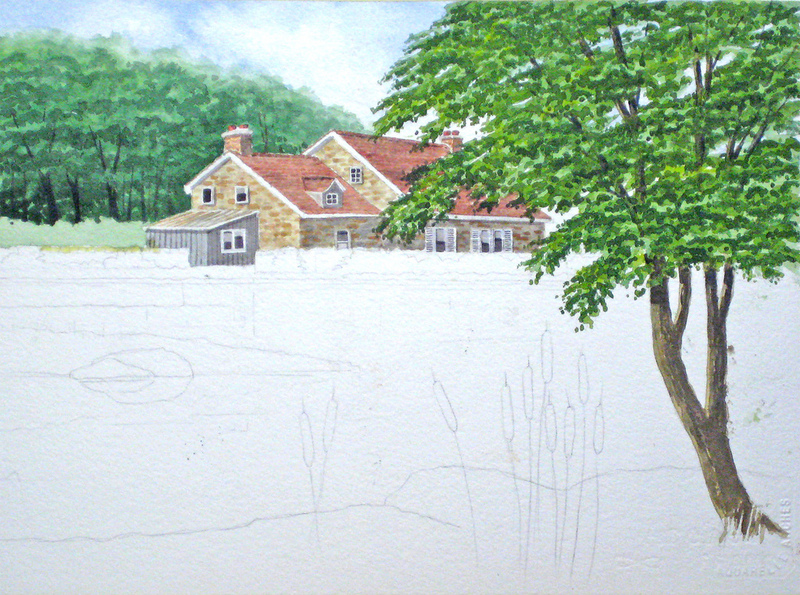 You should gently soften the tops of the background trees and make sure there are no accidental shapes needing treatment. Now indicate some tree trunks as with did in our previous tree session. 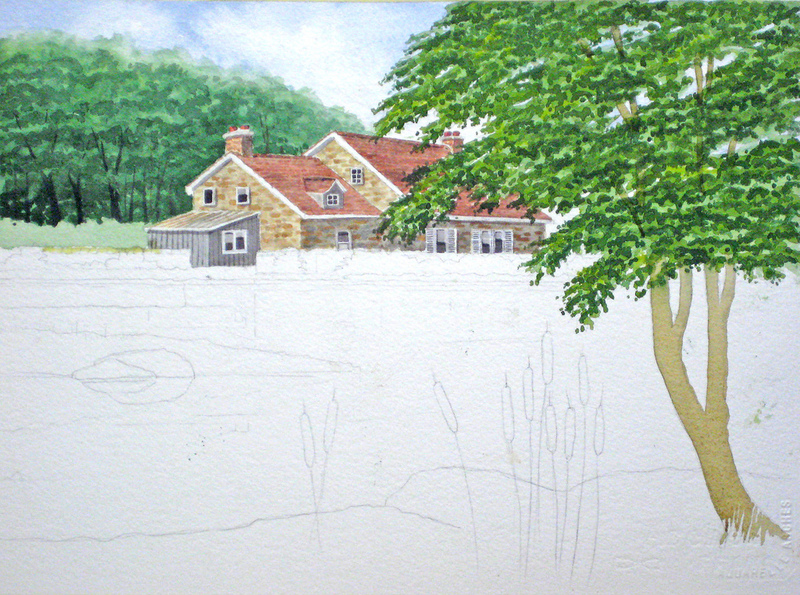 Keep the distant tree trunks smaller and thinner to indicate perspective and distance. Remove the liquid masking except from the lower wall. 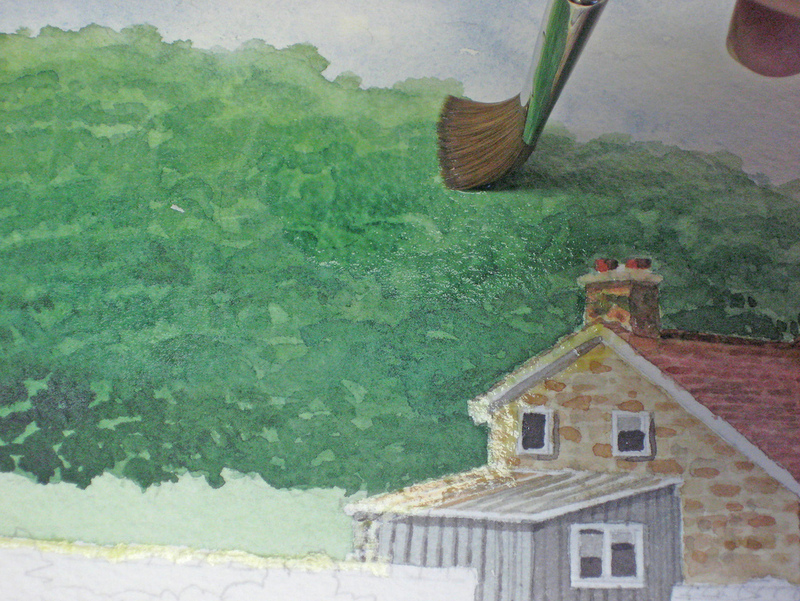 Block in the foreground tree with a #6 round or 1/2″ angle brush, with a wash made from Aureolin Yellow, Sap Green, a touch of Antwerp Blue and our basic shadow colour. 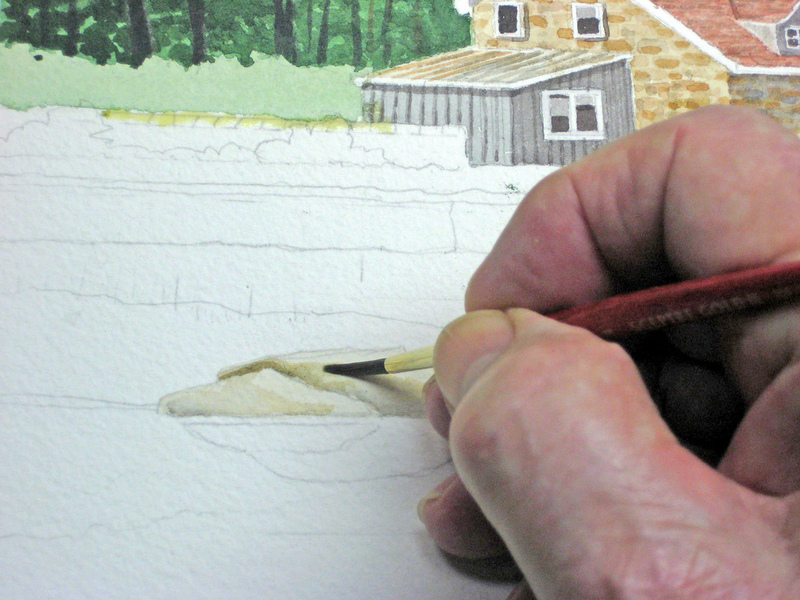 Switch to a #4 round brush where the leaves meet the cottage and lake. Here is how it should look. Note some open areas in the foliage for the sky and tree branches to show up. 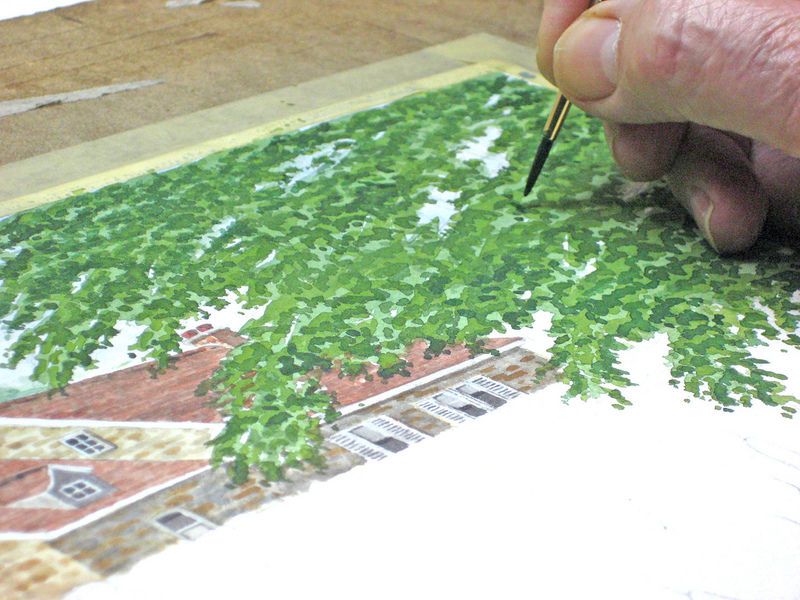 Using our foliage technique again, block in the second layer with a #6 round brush. Darken the green with Antwep Blue and our shadow colour. Keep your brush fully loaded with colour at this stage. Here is the second layer, just as we did in our tree project. Our third layer uses a darker shade of green. Using a #6 round brush fully loaded with colour, start to pick out the negative painting areas as we did in our tree project. There is plenty of scope here for personal style as you try to create a smaller leaf structure than our previous foliage project. Dab on the colour and occasionally go back and drop some colour into partly dry areas. Keep stepping back to make sure the overall effect is what you want. When in doubt, half close your eyes and squint at it. 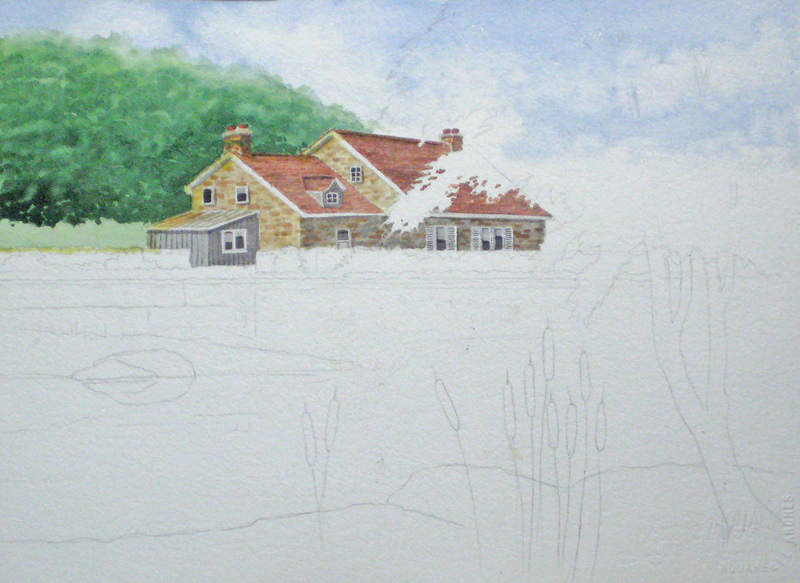 This reduces the tonal values and helps you correct any obvious areas with improper colour or placement. Our third layer should look something like this. 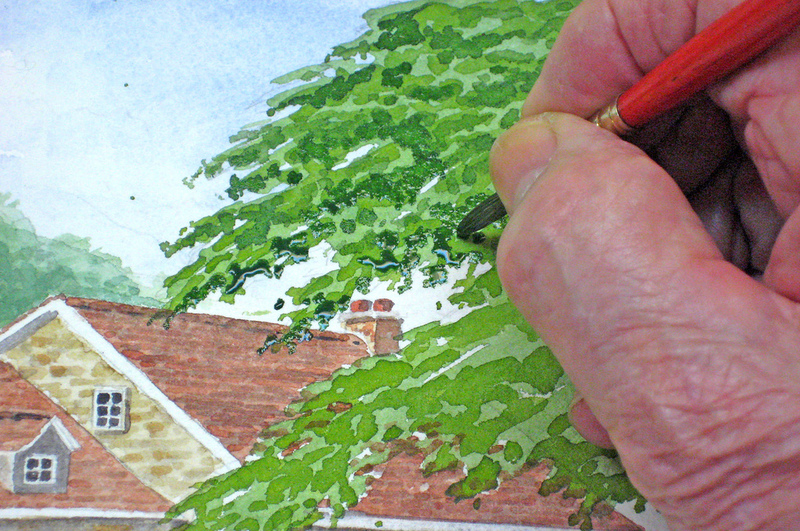 Our fourth layer is applied using a fully loaded #4 or #6 round brush, with a darkened mixture of our basic green. Once again, seek out those areas for our negative paining technique. How you do this will depend on your personal style. Keep stepping back to view your results. Don’t rush this. Hold your #4 or #6 brush as shown, keeping your wrist on the paper for maximum leverage, and with your fully loaded brush dab straight down. Go back occasionally to drop some of the colour in spots not quite dry to blend in the technique. This is how it should look at this stage. Later you may come back and modify this to suit your personal style. That will do for today. Tune in again for the remaining images. 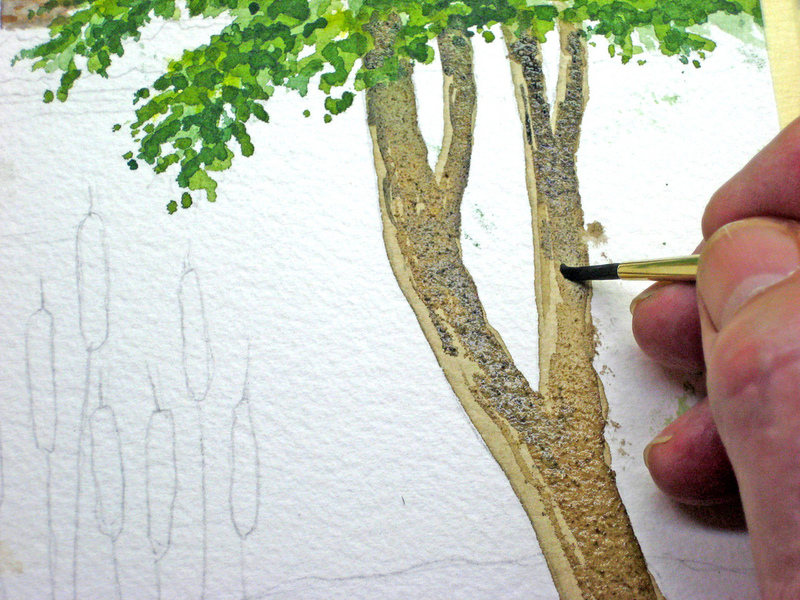 Working on the tree trunk will give the plenty of opportunity to develop your own style and technique, but here I’m working wet-in-wet using a #4 round brush well loaded with a strong shadow colour made from Antwerp Blue and Brown Madder. At the base of the trunk I leave some negative painting areas for later grass to show up. Also note the messy spot beside my brush were I was careless. Never mind, with clean water and a scrub brush I can lift this out with our blot and lift technique. 300 lb. paper is very forgiving. The completed trunk and branches. Later modification may be needed depending on the finished painting. In this project there is plenty of scope for your own interpretation and these images are for your guidance only. Each student will bring a different approach, both in colour, tonal values and the general appearance. 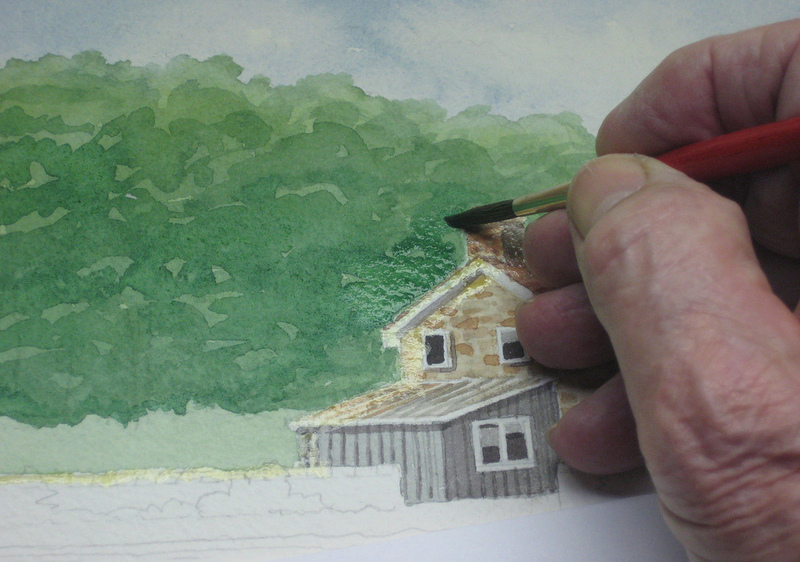 There is no “right” way to realism in watercolour, and the degree of realism will depend on what you decide to create. Before we map in the reflections, I’ll block in the middle-ground rocks with a light wash of Raw Sienna with a touch of Brown Madder and our shadow colour. Then go over with the washes that will make one look behind the other. You can use a mix of colours including Brown Madder, Raw Sienna, our shadow colour, a touch of Ultramarine – anything you feel will give these rocks rugged and solid look. The extreme close-up images distort how we actually look at a painting, so always remember to step back occasionally for proper viewing distance. In this case about six to eight feet away.